As I approach the conclusion of my undergraduate career I have begun to reflect on the very first days that I stepped on campus. By starting the next phase of my life it was unavoidable that I would receive words of advice and wisdom from my predecessors on campus. These included: “Try to make it to class,” “Get used to pulling all nighters,” and “Don’t take Tylenol when you’re hung-over.” I was aware that the first two were legitimate concerns when I started my higher education but, to be honest, I was unsure of the implications and reasons behind the third bit of advice. I soon learned that it is somehow harmful to have Tylenol and Alcohol in one’s body at the same time. I have lived up to this bit of advice to this very day, but it is not until I am nearly done with my undergraduate education that I can truly understand the implications of this dangerous duo in a mechanistic and biochemical manner. To start off let us embrace the fact that, as an undergraduate, alcohol is easily accessible and is popular amongst this demographic as a recreational drug. Be that as it may, the metabolism of alcohol is not commonly contemplated. What is actually being metabolized in an alcoholic beverage is the psychoactive ingredient, ethanol. The first step in the metabolism of ethanol is the oxidation by alcohol dehydrogenase along with NAD+ to acetaldehyde. 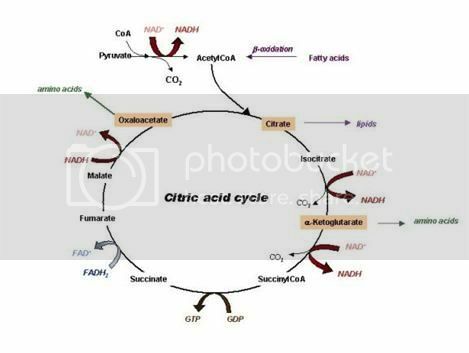 Further oxidation leads to the production of acetic acid and CO2 + H2O via the citric acid cycle. 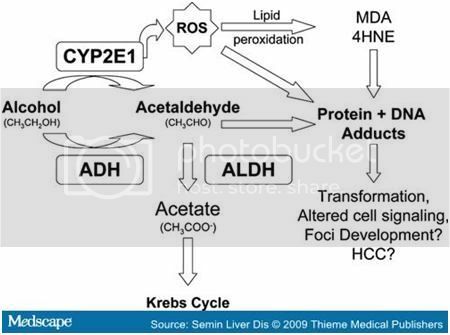 The excess production of acetaldehyde and NADH cause the metabolic constraints on the human body that we observe as liver damage when there is a chronic intake of alcohol. More specifically it is the excess production of acetaldehyde that leaks into the blood stream when the body cannot break down it down into acetic acid quick enough. This problem then results in the acetaldehyde imparting it’s toxicity on the nearby mitochondria causing its function to become impaired. Within a cell acetaldehyde can covalently bind with enzymatic proteins as well as tubulin structure which decrease microtubule polymerization. This truncation of microtubules means that there will be a buildup of tubulin components to the point that we can witness irregular cell shape and even hepatic swelling. At this point in the pathway there forms a cycle by which the presence of acetaldehyde inhibits the function of the mitochondria. Mitochondria promotes the degradation of additional acetaldehyde and with time causes tissue damage, also known as hepatitis and cirrhosis. The metabolism of alcohol generates acetaldehyde along with acetate. The acetate feeds into the Krebs cycle that influences acetyl-CoA generation and, in turn, NADH generation. Both of which can harmful in excess. 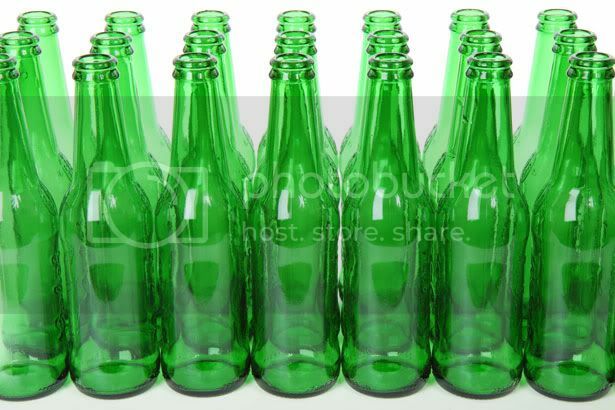 At this point in our exploration of alcohol it seems safe to say that the toxicity of overconsumption is dangerous simply due to rate limiting steps in the body. If your body takes on more than it can handle, the leftovers find their way to alternate points that can inhibit cellular function earlier in the metabolic pathway. So let’s say that a 21 year old undergraduate has experienced his/her first big night of college drinking. Despite having a great time with friends it seems that this student is experiencing what is commonly referred to as a hangover. Now feeling sick to the stomach and aching with pain, students often reach to medication for some symptom relief. But before this step is taken, remember that bit of advice that was given as you began college: Do not take Tylenol for a hangover! Due to my own undergraduate education I am now able to comprehend the gravity of this statement in much more meaningful way. The over the counter medication we commonly refer to as Tylenol is effective due to its active ingredient, Acetaminophen. Drugs are often processed via similar routes, so in this case having Acetaminophen and alcohol metabolized in the liver can cause a metabolic bottleneck in which the previous issue of toxicity is even more rampant. Taking a closer look at the biochemical break down of Acetaminophen will allow us to truly figure out the molecular basis for its toxicity. As I mentioned before, the bottleneck issue that we encounter is the starting point for our potentially harmful situation. Normally, small doses of acetaminophen are metabolized by means of UDP-glucurotyl transferase and sulfo transferase that leads to secretion in the urine via the kidneys. When the normal degradation pathway is blocked for Acetaminophen break down, a separate pathway that utilizes an enzyme known as the cytochrome P450 enzyme is called into action. Because the Acetaminophen is forced to take an alternate route of metabolism the normally less than toxic byproducts are instead formed into a toxic byproduct called NAPQI (N-acetyl-p-benzoquinone imine). This metabolite is dangerous and unstable. NAPQI influences the complete release of Ca2+ ions in the hepatocytes by means of oxidation to cysteinyl groups of membrane Ca2+-ATPase. This cytosolic increase in Ca2+ concentration leaves the cell with an unbalanced Ca2+ homeostasis that plays a role in cellular structure. Without adequate structural support the ailing hepatocyte succumbs to cellular death. 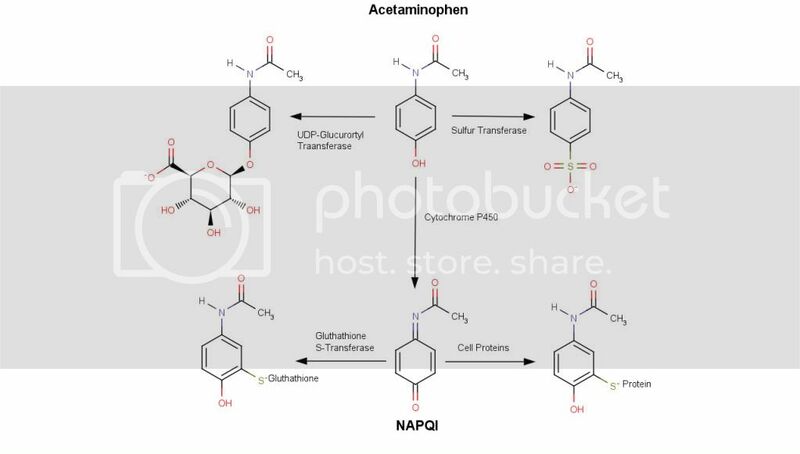 Here is a visual representation of the possible metabolic paths of acetaminophen (Tylenol). We see here that the enzymatic breakdown by Cytochrome P450 promotes the generation of NAPQI, a toxic byproduct. I have taken the time to generate a Marvin sketch that can give us a better visual representation of the byproducts and their molecular structures below. Should a person take a small dose of acetaminophen, there are natural defensive forces that our body utilizes in order to neutralize the threat that is NAPQI. The main force in defense would be the glutathione detoxifying system. Glutathione is an antioxidant whose unusual peptide linkage contributes to the reduction in disulfide bonds formed within cytoplasmic proteins. In this case, our disulfide bond is formed between NAPQI and cellular proteins. Its effectiveness as an antioxidant against NAPQI activity has caused it to be used in hospitals for patients who have overdosed, either by accident or intentionally, on acetaminophen. Glutathione can also be used as a measuring stick when inquiring about blood toxicity levels. 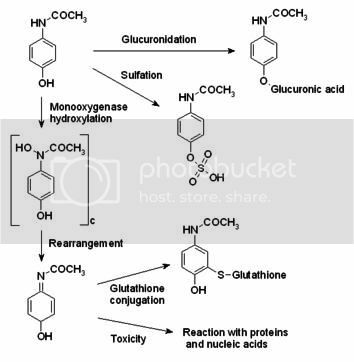 Should the ratio of oxidized Glutathione to reduced Glutathione be too high it can indicate that the body is actively fighting some toxic agent at the moment. At the top left corner we have the active ingredient in Tylenol, Acetaminophen. Normal metabolism takes a route dubbed Glucuronidation resulting is nontoxic Glucuronic acid. The pathway taken downward is a route enabled by P-450. The toxic NAPQI is the result of this process and can be dealt with by the body’s naturally occurring Glutathione via conjugation. Due to a cell’s limited supply of Glutathione, the toxicity of NAPQI is not always fully subsided. There you have it curious social drinkers. The prospect of overloading the liver system via the biochemical paths previously stated is not worth the risk of generous damage that can be done to one’s own life. Let it be noted that these effect are not limited to Acetaminophen necessarily. Acetaminophen alternatives like Ibuprofen can be just as harmful when taken in high enough doses. 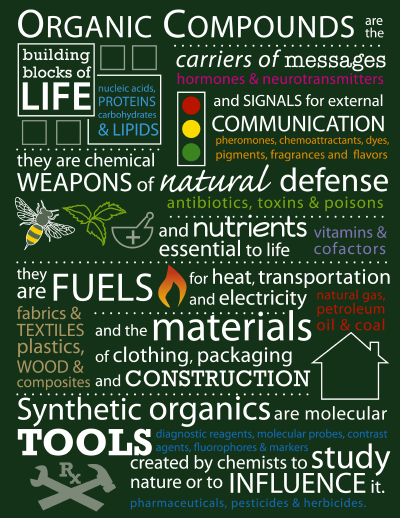 The same logic applies except the metabolites may have a different means to the same end. As a result of our newly attained enlightenment I hope that readers are not only able to head warning to their peers but to also educate them so that while we spend our extracurricular time out having fun we are all attaining a better understanding of our world and ourselves while also staying safe. "Alcohol Metabolism." Web. 5 Mar. 2012. <http://www.elmhurst.edu/~chm/vchembook/642alcoholmet.html>. Highleyman, Liz. "The Liver: Acetaminophen and Your Liver." HVCA Advocate. Web. 5 Mar. 2012. <http://www.hcvadvocate.org/hepatitis/factsheets_pdf/Acetaminophen_09.pdf>. Lieberman, Michael, Allan D. Marks, and Colleen M. Smith. Marks' Basic Medical Biochemistry: A Clinical Approach. Philadelphia: Wolters Kluwer Health/Lippincott Williams & Wilkins, 2009. Print. Moore, Margo. 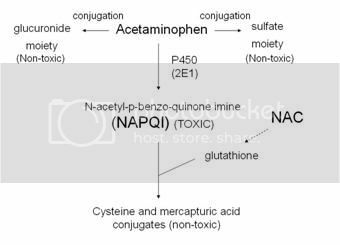 "The Toxicity of Acetaminophen and N-Acetyl-p-benzoquinone Imine in Isolated Hepatocytes Is Associated with Thiol Depletion and Increased Cytosolic Ca2+." THE JOURNAL OF BIOLOGICAL CHEMISTRY 260.24 (1985): 13035-30340. The Journal of Biological Chemistry. Web. 5 Mar. 2012. <http://www.jbc.org/content/260/24/13035.full.pdf>. Great topic selection! This is obviously a big issue as I know plenty of people willing to load up on tylenol after a night of drinking. So many people (myself included) are so willing to down the pills to keep the hangover away without realizing the damage they're doing to their liver. Honestly I hadn't realize that tylenol could be so toxic!You have lot of really good information here, and have really done a good job of conveying your topic. Your paper reads very well too! Great job! Great post. I have heard this adage too many times in the past four years and finally know the science behind it. One of my questions as I was reading through it was whether the body has any natural defenses against this toxic buildup, but you completely covered that in the las paragraph talking about the glutathione detoxifying system--very cool. I thought the information presented was intense, but still very readable and the images really enhanced the page, especially the MarvinSketch. Seeing the alternate metabolites next to each other helped me get a grip on what was happening through the conflicting pathways. You mention at the end that Ibuprofen (my choice hangover relief pill) can be just as dangerous if taken in high enough doses. Does that mean that Ibuprofen is less toxic? I would be interested in seeing a comparison between the metabolism of different such drugs. Overall, the post was very informative and well organized. Nice work!